On September 8, Saudi and Yemeni forces found a remote controlled explosive boat belonging to Houthi rebels off of Fasht island on Yemen’s western coast. The small and low-profile boat appeared to have been heavily modified to reduce its visibility on the water and had been packed with explosives. The discovery came as no surprise, as the conflict in Yemen has seen the development of several unmanned boat bombs by Houthi militants, manufactured with what many observers have reported to be Iranian assistance. Since 2017, in fact, there have been several reports of attacks or discovery of these unmanned explosive vessels in the country. In January 2017, a remote controlled boat was used by Houthi rebels to strike the Saudi frigate Al Madinah 30 kilometers from Al Hudaydah, a port city on the western-shore of Yemen under the control of Houthi militias. The explosion killed two sailors and injured three others, but the ship was able to make it back to port on its own. Few images exist of the Houthi remote control boats. The imagery which is available suggests that at least two different kinds of boats have been made so far. 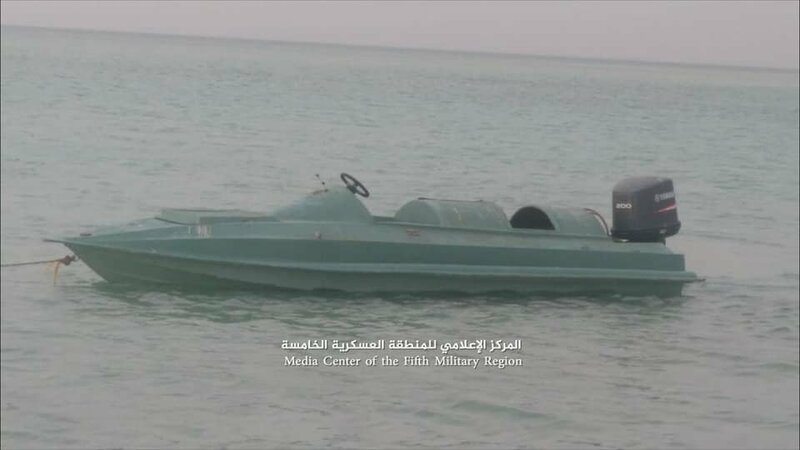 The first, which was captured by Saudi Coalition forces in the January 2018 failed attack, is a lightly modified speedboat. An image released by the United States Department of Defense labels it as the Shark-33. It shows a boat powered by two 200 horsepower Yamaha outboard motors and fitted with a camera, hydraulic steering, GPS antennas and a navigation computer. A Conflict Armaments Research report, which examined the boat, revealed that the craft was a former UAE Coast Guard boat that had been donated to the Yemeni Navy and later captured by the Houthis. Many of the components used to transform the vessel into an unmanned platform were made in Iran. Furthermore, researchers found that the vessel was equipped with the warhead of a P-15 Soviet-manufactured anti-ship missile, supplied by the Soviets to Yemen in 1989. As also noted by other experts, the appearance of this low profile boat shares some interesting similarities in appearance with suicide boats of the Tamil LTTE Tigers. The Sri Lankan secessionist group was particularly advanced in the development of kamikaze boats and low profile vessels, which were employed with some degree of success. It is possible that the change in design may have been the result of a change in suicide boat strategy by the Houthis following the foiling of earlier attempted attacks on Saudi and Coalition ships and assets. The use of manned suicide boats can be traced all the way back to the US Civil War, when Confederate forces used semisubmersible crafts packed with explosives against Union Forces. A more widespread use of the weapon was seen later during World War Two, when Italian, Japanese (and to a lesser degree the Germans) used suicide explosive boats with some success. As for unmanned explosive boats, one of their first uses actually dates back to World War 1, when the Germans developed the ‘Fernlenkboot’, a small remote controlled boat packed with 700 kg of explosives that was supposed to be guided from shore through a cable . The unmanned boat was designed to target British ships blockading the German coast without putting the crews in danger – a strategy remarkably similar to that of the Houthis. However, only one managed to actually hit a heavily-armored British ship and it only caused minor damage. In our times, the Arabian Peninsula, and Yemen in particular, have been a hotspot of suicide boat activity by different groups. One of the most infamous attacks occurred on October 12 2000, when a small fiberglass boat loaded with C4 explosives struck the American destroyer USS Cole in Aden’s harbor, killing 17 sailors and wounding 39. The attack, which was claimed by al-Qaeda, was not the first that the group had attempted against a U.S. vessel. Earlier that year, al-Qaeda operatives had attempted to target the USS The Sullivans destroyer, as it was refueling in Yemen. The plot, which was almost identical to the bombing of the USS Cole, failed when the “suicide skiff” sank because it was overloaded with explosives. Similarly, in October 2002 al-Qaeda launched a suicide attack on the French-flagged oil tanker MV Limburg as it approached the port of Mina al-Dabah, killing one sailor and lightly damaging the ship. Another interesting story regarding the use of suicide boats in the region took place during the Suez Crisis in 1956, when Jules Jammal, a Syrian Christian naval officer, allegedly packed a boat with explosives and rammed a French ship, sinking it. The story may be no more than propaganda, but it was highly praised and portrayed as a glorious action carried out in the name of Pan-Arabism. In fact, a battalion of the pro-Assad “Arab Nationalist Guard Militia” bears the name of Jules Jammal, reflecting the importance of the story and the symbolic power that martyrdom operations may carry. While the use of remote controlled boats by Houthi militants is still rather rare, it is nonetheless significant. As the Saudi Coalition has set up a naval blockade around Yemen and maintains clear superiority on the seas, Houthi operations on the waterways represent a serious threat to both civilian and military vessels. The Red Sea and the Bab al-Mandab Strait are vital and crowded sea lanes where around 4.8 million barrels of oil products transit every day. Alongside instability in the area, mines, and anti-ship missiles, suicide boats could have serious economic and political impacts. Furthermore, the area is attractive to attackers – at its narrowest point it is only 29 kilometers wide. In July 2018, an attack by Houthi militants on two Saudi oil-tankers prompted Saudi authorities to temporarily halt oil shipments through the Bab al-Mandab strait. While the Saudis were able to use a pipeline which runs from the east to the west of the country, thus bypassing the strait, the temporary halt shipments served as a warning. The complete closure of the passage would mean forcing ships to circumnavigate Africa in order to transit to and from Europe. The explosive boats are part of a bigger picture, where Houthi rebels aim to undermine and pressure the countries of the Coalition by targeting both military and civilian infrastructure. They have also launched ballistic missiles into Saudi Arabian cities and oil facilities, fired anti-ship missiles at Saudi-Coalition ships, attacked Saudi tankers with rockets, and laid mines. The strategy is remarkably similar to the Iranian and Iraqi actions during the “Tanker War”, albeit at a smaller scale. Furthermore, the East African coast is home to important Emirati and Saudi naval and military bases in Assab, Eritrea and Djibouti. The facilities have played an important role in the war in Yemen, serving as logistical staging areas for operations and for the control of the sea lanes. These facilities, especially the port of Assab, are also vulnerable to attacks by suicide boats. It is important to note that unmanned suicide boats are a particularly appealing weapon for the rebels. While they require a certain degree of technical skill to manufacture, the boats can be accurately guided towards a target by rebels through cameras and GPS guidance by virtually anyone, unlike anti-ship missiles which require trained personnel. They also have serious striking power and tactical advantages. Small skiffs fitted with a powerful motor and packed with explosives can be a deadly weapon even against larger military vessels, which are often well-equipped to counter large ships, submarines and aircraft, but can be remarkably vulnerable to smaller, stealthy vessels. These vessels are also difficult to track by radar and hard to target. In addition, the battle space off of Yemen is particularly crowded – warships find themselves operating in littoral environments with islands, packed with civilian ships, and close to the shore, where militants can lie waiting for their chance to strike. Furthermore, as these vessels are usually civilian boats, it is inherently difficult to identify the threat. The evolution from manned to unmanned suicide boats certainly requires a degree of technological sophistication and this may implicate state actors. In fact, the conflicts in Syria, Iraq, Libya and Yemen have witnessed a significant growth in the technological skills of rebel and terror groups, especially following the conquest of territory and the acquisition of resources. Islamic State, for example, developed assembly lines for drones and suicide vehicles, including remote controlled explosive vehicles. For terrorist and rebel groups, the suicide vehicle, whether manned or unmanned, can be a highly significant force multiplier. J. Trevithick, Yemen’s Houthi Rebels Reportedly Attacked a Saudi Oil Tanker in the Red Sea, The Drive, April 3, 2018: http://www.thedrive.com/the-war-zone/19860/yemens-houthi-rebels-reportedly-attacked-a-saudi-oil-tanker-in-the-red-sea (Accessed September 26, 2018). Anatomy of a ‘Drone Boat’, Conflict Armament Research, December 2017: http://www.conflictarm.com/publications/ (Accessed September 26, 2018). Video: Saudi forces destroy Houthi boat, foil terror plot in Jazan, Al Arabiya, April 25, 2017: https://english.alarabiya.net/en/News/gulf/2017/04/25/VIDEO-Forces-destroy-Houthi-boat-attempting-to-breach-Saudi-maritime-borders.html (Accessed September 26, 2018). J. Binnie, Saudi coalition says RC bomb boat intercepted, IHS Jane’s Defence Weekly, January 31, 2018: https://www.janes.com/article/77486/saudi-coalition-says-rc-bomb-boat-intercepted (Accessed September 26, 2018). Newsroom A press conference for the spokesperson of the Arab Alliance, ExtraNews, September 11, 2018: https://www.youtube.com/watch?v=AZx4SN_k38s (Accessed September 26, 2018). HI Sutton, Houthi Navy, Covert Shores, September 11, 2018: http://www.hisutton.com/Houthi_Navy.html (Accessed September 26, 2018). B.E. Trainor, Gulf Risks: Mines and Suicide Boats, The New York Times, 1987: https://www.nytimes.com/1987/08/14/world/gulf-risks-mines-and-suicide-boats.html (Accessed September 26, 2018). A. Jawad Al-Tamimi, The Arab Nationalist Guard: A Pro-Assad Militia, Aymenn Jawad Al-Tamimi, January 1, 2014: http://www.aymennjawad.org/14235/arab-nationalist-guard (Accessed September 26, 2018). J. Blas, Saudis Suspend Oil Shipment Via Bab el-Mandeb After Attack, Bloomberg, July 26, 2018: https://www.bloomberg.com/news/articles/2018-07-25/saudis-halt-oil-shipments-via-bab-el-mandeb-strait-after-attack (Accessed September 26, 2018).